The new Citroen C6 is a luxury sedan set apart by a distinctive shape, loaded with modern technology, and driven by a V6 engine. THE NEW Citroen has rounded, dynamic lines and an unusually designed rear end with a concave window that sets it clearly apart from its competition. Its tilting spoiler on the luggage hatch increases the car’s stability at high speeds and serves as an additional aerodynamic brake. The C6 has its transverse V6 engine in the front – either a 3.0-l, 215 hp (155kW) gasoline version or a 2.7-l HDi diesel with an FAP solid particle filter that turns out 208 hp (150 kW) and torque of 440 Nm at 1,900 rpm. Both engines are mated to a six-speed automatic transmission and have top speeds of 230 km/h. With a wheelbase of 2.90 meters and an overall length of 4.91 meters, the Citroen C6 offers a large, comfortably equipped interior that is protected by nine airbags. In the C6 Lignage (and models higher in the line), selected data can appear on the windshield as a Head-Up Display, and at night the driver is assisted by bi-xenon headlights that point into turns on the road. The top of the line, the C6 Exclusive, has leather upholstery, a warning system when the car deviates from the lane (AFIL), a NaviDrive navigational and communications system, and a JBL hi-fi stereo, but all of these features can be added to a C6 Lignage for surcharges. 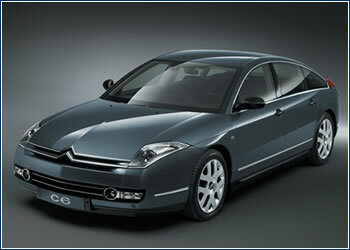 Citroen C6 list prices range from CZK 1,250,000 for the C6 with the 3.0-l V6 gasoline engine to CZK 1,630,000 for the C6 Exclusive with the 2.7 l HDi V6 turbodiesel.